In 2007 I started this blog on gardening. I didn’t know where I was going with it, or what I was really doing to begin with, but I knew I wanted to talk more about gardening with other gardeners. I was constantly talking about gardening and garden ideas with my family, and I’m sure they got tired of my incessant prattling about what plant would be good here and what design idea to put there. Ideas have never been never anything I’ve been short on! So I started this blog toward the end of the month of October in 2007 in order to prattle on to a larger audience. It’s been over five years now. I’ve posted over 1,800 posts and GrowingTheHomeGarden.com has had over 900,000 visitors since July 13, 2009 (when I started tracking). That averages to over 20,000 visits per month. Pages have been viewed here over 1.7 million times. I’m really astounded and grateful for all those who have stopped by, followed the blog, or left comments. I really and truly appreciate you and everything you do to support this blog. When I began writing I was writing nearly every day of the week. Over time I cut back a little. Mostly because as our family grows my time hasn’t. As a stay at home dad my mornings switched from running out to the garden at 6 AM or blogging about a new plant to getting school lunches made and rushing the kids out the door to the bus stop. Life changes just like the garden. It evolves and so must the gardener. Where is GrowingTheHomeGarden.com going in the future? Nowhere and somewhere I hope! Going into a new year of blogging is exciting. Another year and new changes in the garden. New things to do, new projects, new gardens (don’t tell my wife), new plants (also don’t tell my wife ;)), and the unknown. Each year new opportunities pop up which are always fun to experience! The blogging will continue! That’s why I thought it was time to freshen the blog up with some new graphics and new features. It needed an update! I spent a good deal of time learning HTML and CSS to redesign the blog. I’m excited to have that new knowledge in my head. It’s like learning a new language, now I know enough to be dangerous! I’ve added a slide show to the main page that will highlight certain special posts. I was also able to fix a few other issues that were bugging me. I do want you to note that this site was optimized for Firefox and Chrome. There are issues that I haven’t been able to correct yet on Internet Explorer which apparently is the most backwards and bugging of all browsers. If you use Internet Explorer I recommend switching! I will continue to tinker away at the IE issues since I do want everyone to enjoy their experience on this blog. I will also be transferring a similar formatting to the Garden Shed Blog and some of the other offshoots of Growing the Home Garden. 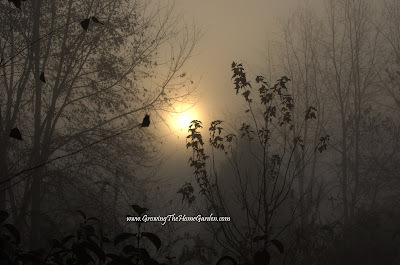 I hope you enjoy the changes and continue to support Growing The Home Garden as it continues into its 6th year of blogging and well into 2013! Dig in and see what we’re Growing in the Home Garden! Looks like you put a lot of work into this. Congrats, you should be proud. Your photographs are beautiful! I love the purple coneflower. I just found your blog and look forward to reading new posts. Have you had any experience with late blight on tomatoes. Some of my tomatoes got it at the end of the season and it sounds like a really bad disease. It's a good sign that you've updated your site! Looking forward to another year. On a side note, I actually just read your blog through my RSS feed reader. Please don't put a jump that forces the reader to go the website – it's much faster to read on an RSS feed reader. The Completed Light Post with Bird Feeder Project!